Beakbane’s composite panels combine high impact resistance with low weight. Beakbane adds that it has also introduced a range of bellows and flexible connectors for applications such as brake actuator bellows, pantograph arm bellows, HVAC connectors and air intake bellows. Beakbane’s composite panels are built around a honeycomb core and offer very high impact resistance combined with extremely low weight. Compared to metal alternatives they are easy to fix and handle, more durable and, because of their light weight, reduce energy costs and carbon footprint. They are typically used on traction units and rolling stock to protect equipment and personnel from flying ballast and other debris. The guards comply with NF F 07-101 and the high strength thermoset polymer they are formed from is fire-resistant to European standards, including DIN 5510, BS476 Pt 7 Class 1, BS6853, and NF F 16 101. 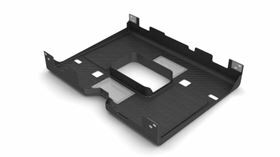 A further advantage of the composite panels is that features such as reinforcements, access panels, mounting brackets can be moulded into the panel during manufacture. Beakbane has recently gained accreditation to EN 15085-2 for the design and welding of railway vehicles and components to cover the metal components used within its composite guards. The certification was required in conjunction with a major export contract Beakbane has entered into with a leading international high-speed train manufacturer. To demonstrate the capabilities of its composite panels Beakbane will be exhibiting a lightweight under-train rock shield featuring examples of moulded in features such as latches, fasteners and metal panels. The underlying strength of the composite material, and the ability to further strengthen it with fabricated steel inserts, make Beakbane’s protective panels ideal for structural and load-bearing applications. This opens up the possibility of re-engineering existing designs to make them stronger, reduce the number of components and reduce weight. The manufacturing route also gives a degree of freedom in design, as three-dimensional forms can be more easily produced by moulding than by fabrication. Typical rolling stock applications include bogie-mounted protective guards for diesel engines, oil filters, signalling sensors, fuel tanks and other ancillary equipment. Composite components are also ideally suited for lightweight inspection panels, streamlining side skirts and bogie-mounted panels. They are equally applicable for streamlined fairings for roof-mounted equipment and to provide protective panels for the driver’s compartment to safeguard against flying ballast and projectiles.